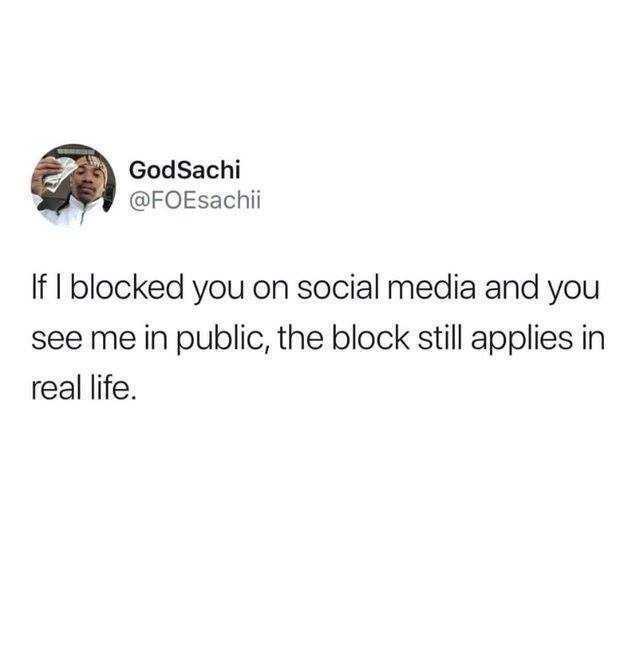 dopl3r.com - Memes - GodSachi @FOEsachii If I blocked you on social media and you see me in public the block still applies in real life. GodSachi @FOEsachii If I blocked you on social media and you see me in public the block still applies in real life. ASAD @asad_abdullah17 Can I please go back to the days where my GCSE English class would pretend to be interested in our English teachers social life so shed go on about her fiancé instead of analysing poems. Dak @Dakota_Stubler Delete the I will do it tomorrow attitude out of your life Veedy @Veedyyy Ima delete it tomorrow.